Hurricane Sandy is bearing down on the east cost of the United States after leaving so much death and destruction in its wake (at last count, 69 people throughout the Caribbean were feared to be dead and that number will certainly rise), and so we are asking everyone to take a moment to lift up their hearts in prayer. For years, our ancestors have turned to the Book of Psalms both in times of despair and in times of delight to find words to help shape their prayers. Today, we scream into the wind or quietly whisper into the sea Psalm 77, trusting that God will once again part the raging waters in order to bring us out of out of trouble and into a land flowing with milk and honey; out of chaos and into peace. When I am in trouble, this is what I will do: I will call to mind the deeds of the Lord; I will remember your wonders of old. I will meditate on all your work, and muse on your mighty deeds. Your way, O God, is holy. What god is so great as our God? You are the God who works wonders; you have displayed your might among the peoples. With your strong arm you redeemed your people, the descendants of Jacob, Rebekah, Leah, and Joseph. When the waters saw you, O God, when the waters saw you, they were afraid; the very deep trembled. The clouds poured out water; the skies thundered; your arrows flashed on every side. The crash of your thunder was in the whirlwind; your lightnings lit up the world; the earth trembled and shook. Your way was through the sea, your path, through the mighty waters; yet your footprints were unseen. You led your people like a flock by the hand of Moses, Miriam, and Aaron, out of trouble and into a land flowing with milk and with honey; out of chaos and into peace. May it be so. As it was in the beginning, is now and ever shall be, world without end. 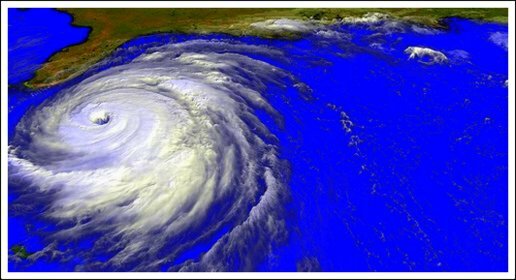 Thank you to Kakela for sharing this image of Hurricane Jeanne in September of 2004.